Terrafugia Transition, the world’s first flying car, has made its first public debut, in which it both flew and drove. 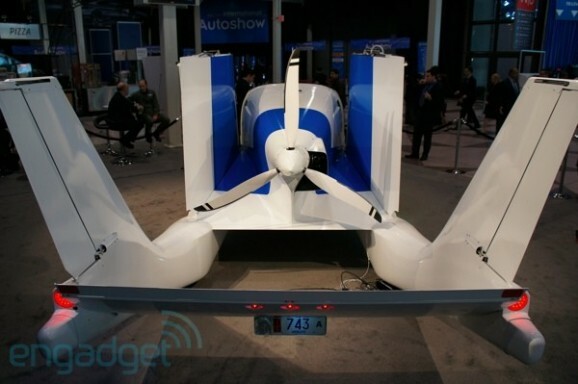 The unveiling of its prototype at a 2012 NY Auto Show featured a short flight, but this week is the first time the public has been able to see the car handle on the ground as well as in the air. At Wisconsin’s EAA AirVenture airshow, the Terrafugia Transition flew a lap around the field, and then landed and folded its wings against its body as it transformed into a car for a lap on the ground. Apparently, the car can fit in a standard garage, so people without hangars don’t need to worry. It reminds me a little bit of a full-sized version of Kenji Ishida’s “Brave Robot” car transformer. Except, you know, it can fly. Terrafugia, whose tagline “we make flying cars” pretty much says it all, is company located in Woburn, Massachusetts, just north of Boston. In 2006, the company won the MIT $100K Business Plan Competition, and they’ve subcontracted for DARPA, so you know they’re legit. One of their longer-term projects is the developing of the TF-X concept, a four-place vertical takeoff and landing hybrid electric vehicle, and their ultimate goal is to “catalyze a revolution in personal mobility,” which…wait, wasn’t that the Segway’s promise? Anyway, the Transition looks a lot cooler than a Segway, and George Bush hasn’t fallen off of one, so things are going well so far. This is Terrafugia’s second version of the vehicle. A third and final version is in the works, but if you’re feeling impatient, you can check out the display model at the Cape Code Heritage Museum. The Transition will be certified by the Federal Aviation Administration as a flight vehicle and by the National Highway Traffic Safety Administration as a ground vehicle, and will retail for approximately $279,000. A $10K deposit will reserve your vehicle for you until its expected 2016 delivery, which leaves plenty of time to plot the perfect crime so you can make full use of this badass getaway vehicle. I’d be WAY more excited if it looked like something I actually want to be seen in. Check out the PAL-V, the Icon A5, etc… these things make me want to use them because they look sporty and fun just sitting on the pavement or water. The Transition, much like the still unproven Moller Aircar don’t have aesthetically pleasing designs which, no matter how amazing the tech involved, won’t garner the sales needed to make the vehicle a success. Hopefully Transition v3 will be something sleek and attractive.